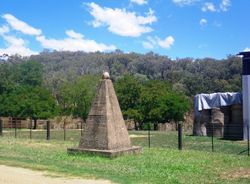 A cairn erected near a campsite marks the centenary of the Hume and Hovell expedition. In 1824 Hamilton Hume and William Hilton Hovell, encouraged by Governor Brisbane, led an expedition of six convict servants overland to reach the Southern coast. A fortnight after leaving Hume's home at Appin, the party left his station at Gunning, on October 17th 1824. They crossed South Eastern part of the present shire of Benalla, and on the evening Saturday 27th November camped by Hollands Creek. They arrived at Corio Bay on December 16th 1824.